You are one of only nine athletes to win world championships at the youth, junior, and senior level of an athletic event and the second woman in history to win two consecutive Olympic 200 m events. Tell us more about your spectacular journey and how it all began? My athletics journey began around the age of eleven. I had always enjoyed running, but around the aforementioned age, I started to take it a little more seriously, having realized I was gifted with the ability to sprint. I was intrigued by any activity that involved running, so much so, that I used to race boys on the streets in my community. I loved to run so much that my mom made me the child of choice to be sent to the grocery store. Mom knew she could begin preparing our meals and I would return in time with the ingredients needed to complete her cooking. I consider myself truly blessed given the success I have been enjoying throughout my career. I give credit to God for gifting me with the ability to be a great sprint athlete. I embraced my talent and by sheer determination, hard work and focus, I have been able to achieve many great things. 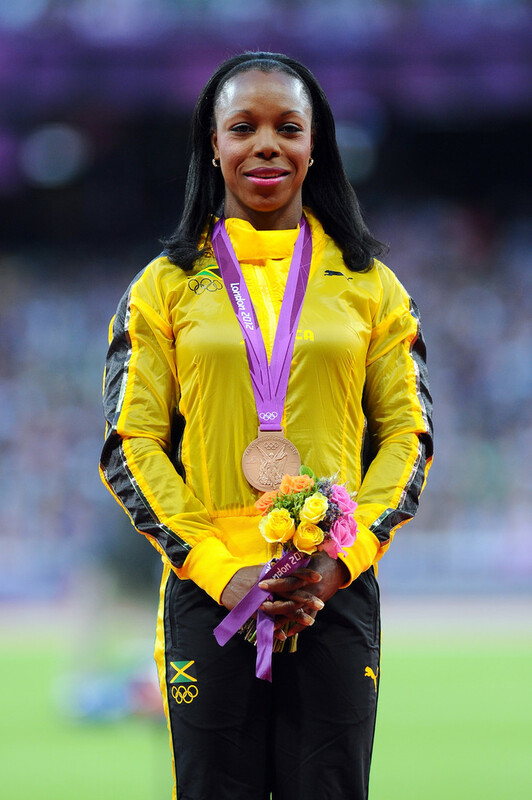 In the 2004 Athens Olympics, at the 200 m finals, you become the first Jamaican and Caribbean woman in the history of the Olympic games to win a sprint Olympic title. How did you feel after this incredible victory? I am humbled to become the first Jamaican and Caribbean woman in the history of the Olympic Games to win a sprint Olympics title. It was my childhood dream to become an individual Olympics gold medalist. So in 2004, when this dream became reality, I was overwhelmed with joy and gratefulness. This showed me that we can achieve anything we put our minds to and that if we can imagine a thing and work towards it we can achieve it. Introduce us to a day in the life of a track & field athlete, preparing for the Olympic Games. A typical training day for me whether preparing for the Olympic Games, the IAAF World Championships or a regular competition is quite similar. I wake up, have breakfast and attend training. Some days, I have one session; other days I have two sessions. After completing my first session, I would take a snack break to refuel before heading to session two, which in most cases takes place in the weight room. After putting in almost six hours of work, I have lunch. After which, I take a nap if time permits, before heading to any therapy appointments I might have such as massage, acupuncture and chiropractic care. Then I would have dinner. After dinner, I would take sometime to relax, read, write or watch TV. My workout regime includes a wide variety of workouts and exercises, as a sprinter my program places great emphasize on speed and power development but at the same time it does not neglect endurance and strength. Some of my favorite exercises include squats, bench press and plyometric.